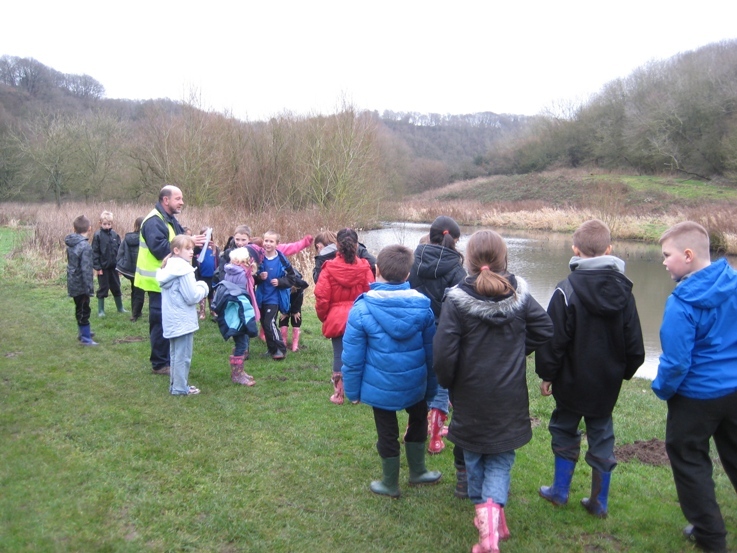 Today I did an "exchange trip" and went to a very different Local Nature Reserve. 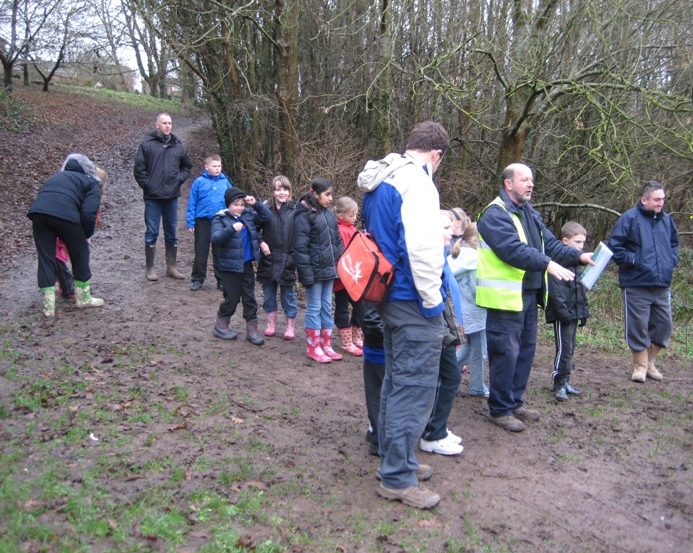 "Our" excellent Community Park Keeper, Julian, had been asked by Ben Wadsworth of Broomhill Junior to lead his class around Eastwood Farm Local Nature Reserve, explaining to the class how the land had been managed, taking it from being a landfill site to the wonderful Local Nature Reserve it is today. Julian asked me along because of the work Rob, he and I had done together with Summerhill School year 3's on Troopers Hill . Julian is, it should be noted, not only doing a great job on Troopers Hill but also looks after 2 other Local Nature Reserves, Eastwood Farm and Callington Rd, with support from his colleague, Carol. He, in turn supports her, helping with St Anne's Woods, Victory Park, Dundridge Park, Nightingale Valley, St Anne's Park and probably a few more than have fallen out of my memory banks. Julian did a great job setting the scene with the class showing them an old map of the area and contrasting it with a modern aerial map. The East Wood from which Eastwood Farm takes its name is still there, but there were no surrounding houses in the 1840s, only fields and the farm house. He showed the grass area that is now left after the tip was filled and the new trees that were planted to keep the filled area stable. He also pointed out the good quality road leading into Eastwood Farm that was used by the lorries delivering the waste. 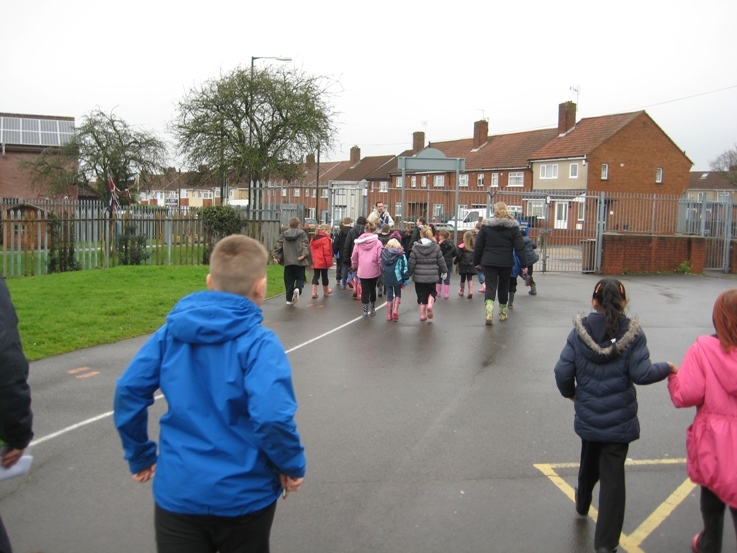 We then ran through a quick list of some of the birds we might see at Eastwood Farm, running through woodpeckers, swans, ducks and herons before we set off. Julian pointed out one of the fenced off airshafts to the railway tunnel as we went past. Then it was down the muddy track on into Eastwood Farm. As we reached the open grass area that is all that is left of the tip site we were lucky enough to see a cormorant flying away. Julian explained the tip had been covered over and grassed, trees had been planted round the edge to stop the land slipping down to the river. Julian was asked if there were any roses as Eastwood Farm. Some were planted as part of the landscaping when the original plans were to turn Eastwood Farm into a more formal park, like Victory or St Georges Park. 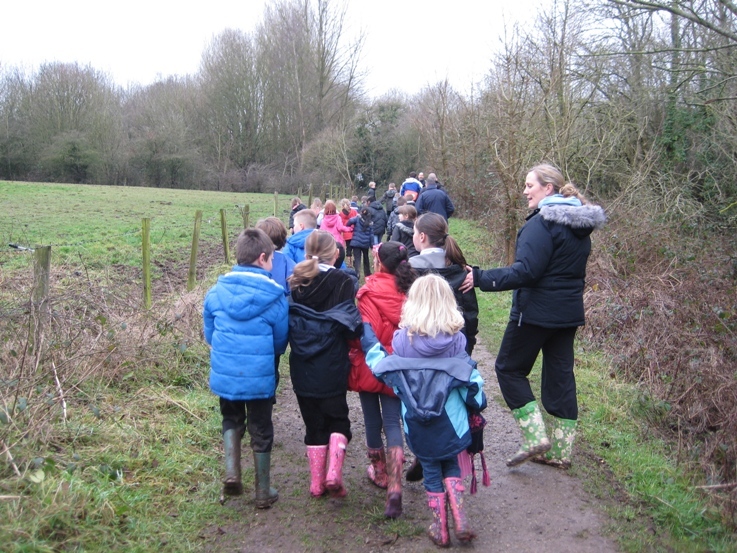 Later plans changed and it was decided that Eastwood Farm would be better as a Local Nature Reserve. As we carried on down the track, past the planted trees, we see how much higher the tipped area was than the original level of the land. Coming down to the water meadows Julian pointed out the effect of the different cutting that he does on the land. He carries out a rotation process of cutting back some of the bramble over a 5 years cycle. This encourages the generation of a wider range of plants, in turn benefitting a wider range of birds, small mammals and invertebrates. If the bramble was left eventually small trees would start to grow, eventually overshadowing the bramble and killing it and the land would become woodland. At Eastwood Farm a balance is being kept between water meadows, woodland and scrub for the benefit of wildlife and people. to see that moles had been active. Julian explained that moles fur just grows straight rather than lying in one direction like a cat or dogs. 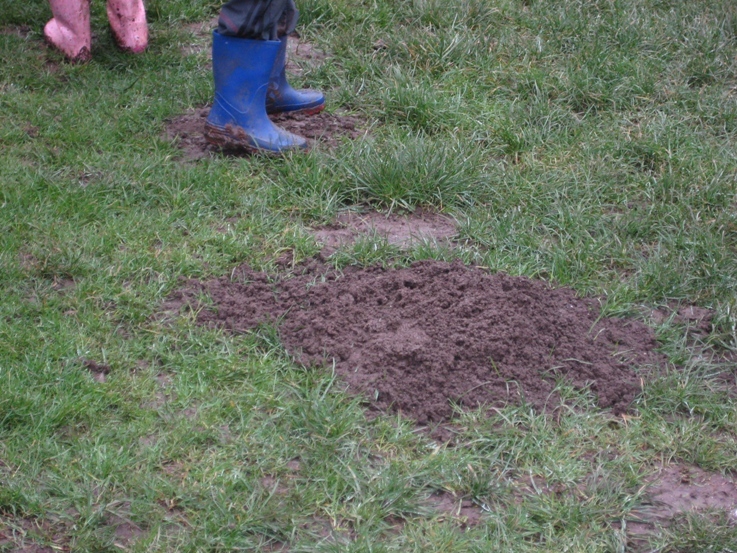 This makes it easier for the moles so they can burrow both forward and backward in their tunnels. What Julian did not know is why they burrow in this area which is frequently flooded by the river. He pointed out the channel linking the lagoon to the river that allows the lagoon to drain when it is overfull and to fill if it sinks. Here Julian pointed out the different cutting regimes. The close mown grass, cut every 2-3 weeks in the growing season does not contain a very varied mix of plants but it provides an area for people to play and exercise. The longer grass, cut yearly with cuttings removed so they do not enrich the soil, allows a range of water meadow plants to grow, flower and set seed. Around the edges of the bomb hole and lagoon the cutting regime is just to stop the edges becoming too overgrown. Some of the children found dead teasel heads so those near me were told about how teasels used be grown for use in the woollen cloth industry. Then it was back up the slope, past the fields, where some horses were admired. We passed the privately owned Eastwood Farm house, which is over 350 years old. 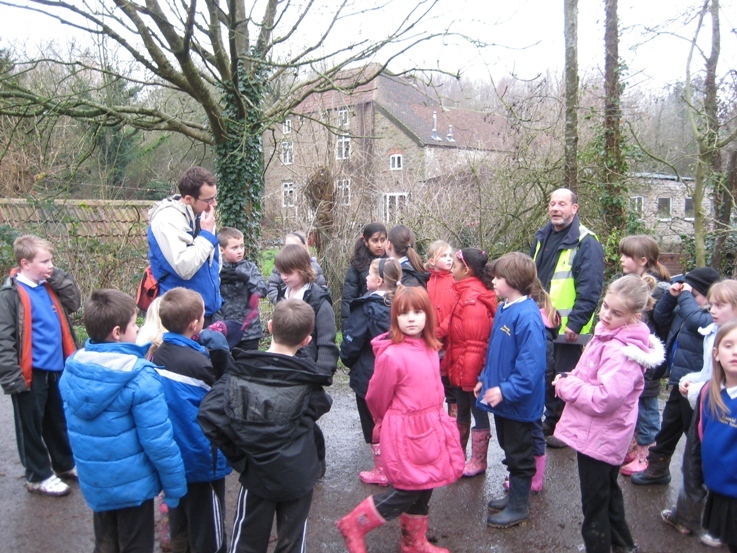 Julian described the rabbits that are off seen grazing near the interpretation board. There was a call for the photo I had brought along that Julian had taken. 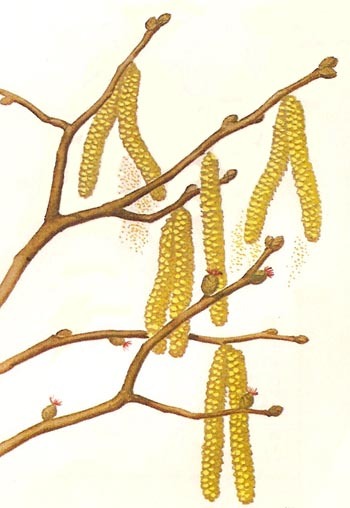 Hazel trees along the side of the track had grown long, golden catkins and were dropping pollen to pollinate the red stigmas of the female flowers. I think this will be a good place for hazel nuts later in the year. Then it was back to school to say goodbye. Lots more photos of Eastwood Farm and some information can be found on http://www.eastwoodfarm.org.uk/. Do go and have a visit. Don't forget in 72 days (Good Friday) Beeses will be open again and you will be able to go by boat from our side of the river, during their opening hours. Here ends my exchange visit report.